For the base of the busy bag I used the front of a cereal box, but any type of no-corrugated cardboard would work. I originally tried making it with the thicker corrugated cardboard and it was too difficult to get clean enough holes to weave through. 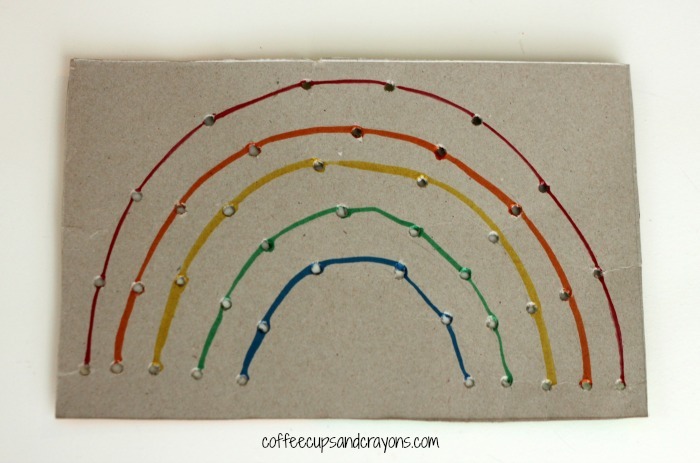 I drew a rainbow with markers on the cardboard and used the screwdriver to poke holes along the lines. I cut any big pieces that were sticking out off with scissors. 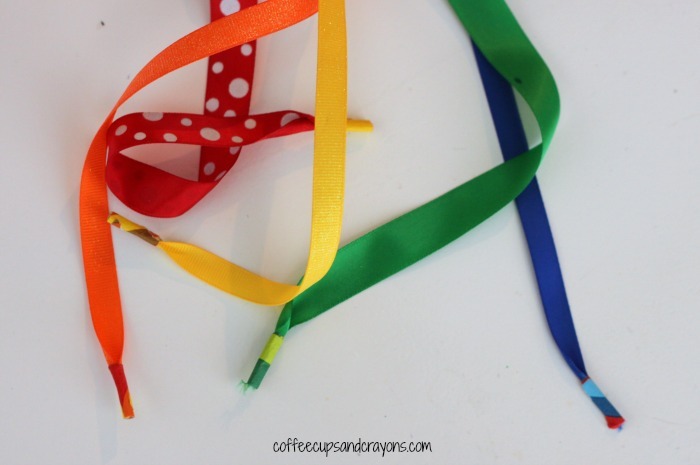 I wrapped the ends of the ribbon with paper tape to make it easier to thread and laced it through the rainbow. I made sure there was extra ribbon at the tape end and then hot glued the other end to the back of the cardboard. My preschooler loves it and played with it all afternoon! Which is a very good thing because if your follow me on Facebook you may have seen that my first version was a total craft fail–way too complicated and hard to use. I was very happy that this version was a hit! Each month we host an online form of a busy bag swap with our Busy Bag of the Month Series! 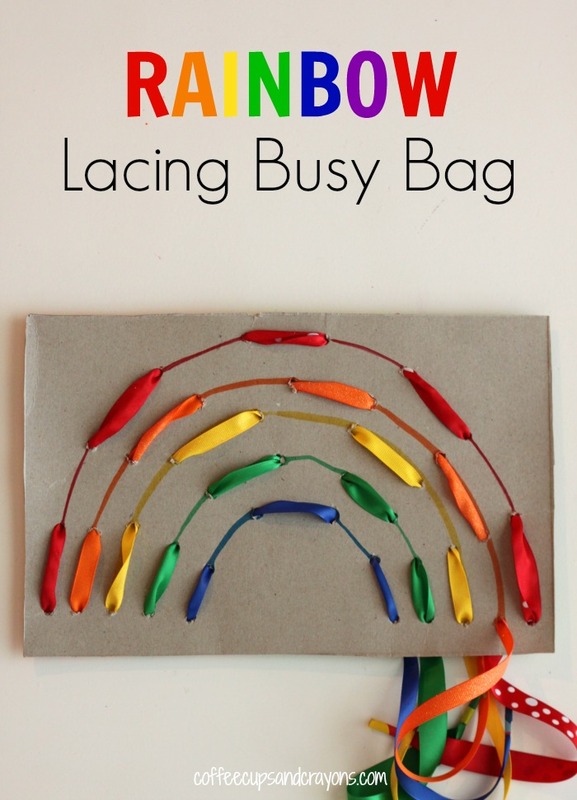 Carolyn from The Pleasantest Thing also made a rainbow busy bag with pom poms–I can’t wait to print and make it for my kids! Love it! I’ll take 2 🙂 this version is perfect! WAY easier than what I was trying to do for an hour!!! So cute and smart! Love this! Jenny I almost lost my mind trying to make this today and simpler was WAY smarter! Thank you! I have never had a harder time making a craft work so I so appreciate it!!! Thanks Shaunna!!! You are totally making my day!!!! TY!!! Thank you! Thank you! Thank you! It made my day that she sat and played with it so many times this afternoon. Such a fun idea! Pinning! This is SO awesome and I love that it is super easy to make! Those are always the best activities!! Pinning! YES!!! Easy ones definitely are the best!!! Thank you! omg – LOOOOVE this Megan!!!! Thank you Sherri and Melissa!!!! This is just gorgeous! What a fun fine motor activity! oh! this is fun and super clever. can’t beat a rainbow really. they are completely joy inducing. I may need to make a few for my class! thank you for sharing! I love this activity. 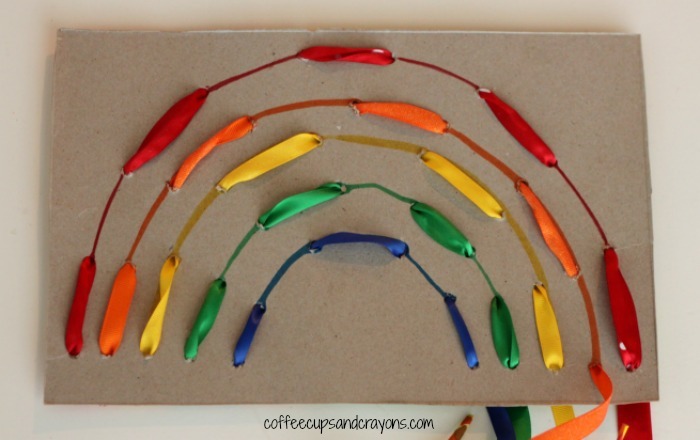 So great for practicing colours and fine motor skills. It has been a favorite around here! Thank you for your post! Great idea! I will try it with my toddler as well. This idea is amazing, I think that my 21 months toddler will love this. Thank you for sharing! Sorry, this may be a dumb question. But is this more of a touch and feel busy bag since it’s all laced and glued together, so a child cannot take ot apart?